Why Immigrate to Australia - Canada Immigration and Visa Information. Canadian Immigration Services and Free Online Evaluation. Australia is a stable, culturally diverse and democratic society with a skilled workforce and a strong, competitive economy. With a population of more than 21 million, Australia is the only nation to govern an entire continent and is the sixth largest country in the world in land area. Australia’s multicultural society includes its Indigenous peoples and migrants from some 200 countries. Before the arrival of European settlers, Aboriginal and Torres Strait Islander peoples inhabited most areas of the continent. Australia’s contemporary history is relatively short, with the first European settlement established by Great Britain on 26 January 1788. Australia has one of the most resilient, high growth economies in the world. It has an efficient government sector, a flexible labour market and a very competitive business sector. With abundant physical resources, Australia has had a high standard of living since the nineteenth century. It has made a significant investment in social infrastructure, including education, training, health and transport. Australia’s workforce of approximately 10 million is highly trained. Many senior managers and technical staff have international experience, while almost half of Australia’s workforce has a university, trade or diploma qualification. In a globalised economy, language skills are a key workforce advantage. Although Australia is an English-speaking country, more than 5 million of its people speak a second language. Australia offers the familiarity of a Western business culture with a workforce capable of operating in both Asian and Western business environments, since Australia has the widest range of native Asian language skills in the region. The language skills and other capabilities that attract foreign companies are, in part, a result of Australia’s culturally diverse society. Migrants have had a marked influence on all aspects of Australian society. In over 60 years of planned post-war migration, Australia has welcomed more than 6.5 million migrants from over 200 countries, including more than 660 000 refugees. The population has increased from about seven million to more than 21 million. Australia has one of the world’s most open and innovative economies and the Australian Government is committed to continue in this direction. Strong growth since the 1990s has been accompanied by strong productivity performance. Australia’s stable economic, political and social environment has led to increased foreign investment in recent years. Since 1990, Australia’s real economy has grown by an average of around 3.3 per cent a year. Australia’s GDP in 2006–07 (in value terms) was just over $1 trillion, making it the world’s 13th largest economy overall and the 10th largest industrialised economy. As a result of major diversification of Australia’s export base, Australia is now not only a commodity exporter, it also has sophisticated manufacturing and service industries. The value of Australia’s exports in goods and services reached $215.8 billion in 2006–07, with service exports comprising $46.2 billion of that figure — 21.4 per cent of total exports. Japan remains our largest export market ($35.6 billion in 2006), followed by China ($26.4 billion), the United States ($15.5 billion), the Republic of Korea ($14.9 billion) and New Zealand ($12.7 billion). A recent OECD study suggests that Australia is ranked as one of the six fastest-growing new economy traders. Australia is strong in information and communications technology (ICT) infrastructure and innovation. It also has an economic and regulatory environment conducive to business and a well educated and trained workforce. Australian investment in ICT as a percentage of gross domestic product (GDP) is the third highest among OECD countries. The Reserve Bank of Australia has found a direct link between expenditure on ICT and Australia’s strong productivity growth. The emergence of e-commerce is projected to add 2.7 per cent to Australian GDP growth over the next ten years. Australia is a tolerant and inclusive society—a nation built by people from many different backgrounds. Vietnam, China, Greece and the United Kingdom are among the main countries from which Australians have migrated. Cultural diversity has become a touchstone of Australia’s national identity. One example of this is the growth of Islam in Australia. Today, Muslims form an increasingly important part of Australia’s diverse, modern society, with the 2006 Census recording a total of more than 340 000 Australian Muslims. Australia accepts and respects the right of all Australians to express and share their individual cultural heritage within an overriding commitment to Australia’s democratic foundations and to English as the national language. Australia’s contemporary arts are as unique and diverse as the society and continent they come from. They reflect an ancient landscape that is home to both the world’s oldest continuous cultural traditions and a rich mix of migrant cultures. Indigenous and non-Indigenous artists alike respond to the imaginative challenges Australia presents in different ways and have developed new modes of expression that have brought Australia’s art and culture international attention. Australia’s system of education is of the highest standard and enjoys international recognition. School attendance is compulsory throughout Australia, contributing to an adult literacy rate of 99 per cent. Our schools develop students’ skills and confidence; Australian university graduates excel at the cutting edge of research and innovation; and vocational and technical education drives our thriving industrial sector. Australia is also one of the world’s leading providers of education and training to international students, including Englishlanguage training. More than 400 000 students from around 200 countries receive an Australian education each year. Courses are offered both in Australia and offshore. Australia’s system of education and training is subject to continuous review and control by government, industry and professional bodies to maintain and improve its already high standards. Quality assurance in Australian higher education is based on a strong partnership between the higher education sector and the Australian Government, state and territory governments. This partnership ensures nationally consistent standards in approval and accreditation, external monitoring and independent quality audit. Australia is committed to establishing a culture of innovation to make the best use of national and international information networks, encourage creativity in all forms of research, promote collaboration between university researchers and industry, and disseminate the outcomes of research to the wider community. Of the 10 Nobel prizes awarded to Australians since 1915, nine were in the field of science. Innovations in science and technology are strong drivers of economic growth. Australia is both well positioned and well resourced to make a difference in the global innovation race. The country has a vibrant and competitive economic environment with high productivity and growth, which provides an ideal climate for innovation to thrive. Australian innovations are world-renowned, and range from medical breakthroughs such as the bionic ear and revolutionary flu treatments through to the world’s first nanomachine, contactless smartcards, and the orbital engine. Australia has a sophisticated, world-leading ICT sector. Its ICT market is the eleventh biggest in the world. The production of ICT goods and services generates revenue of around $54 billion and ICT industries earn more than $100 billion. ICT gross domestic product (GDP) accounts for around 4.6 per cent of Australia’s total GDP. Business use of the Internet continues to grow. Around 60 per cent of small and medium enterprises (SMEs) placed orders for products and services online in 2006 and 47 per cent took orders online. Among overall online activities, accessing government services and Internet banking are most popular, with 59 per cent of people in Australia in 2007 contacting government via the Internet in the previous 12 months, and 40 per cent of adults banking online in September 2006. Australia has one of the highest rates of mobile phone ownership in the world, with state-of-the-art network coverage available to more than 98 per cent of the population. Australia’s spectacular natural environment, multicultural communities, food and wine, the friendliness of its people, combined with its weather and lifestyle place it amongst the world’s most popular tourist destinations. These qualities also make it one of the best places in the world to live and conduct business. Tourism is one of Australia’s largest and fastest-growing industries. The number of short-term visitors to Australia grew from 4.3 million in 1997 to a record 5.6 million in 2007. The inbound tourism sector contributed about $22.6 billion to the Australian economy in 2006–07. Inbound tourism accounts for 12 per cent of Australia’s total export earnings, more than the combined value of Australian iron ore and aluminium exports for the year. Australia’s unique environment has many native plants, animals and birds that exist nowhere else in the world. The country is actively committed to conserving its natural heritage and has a range of protection procedures in place. 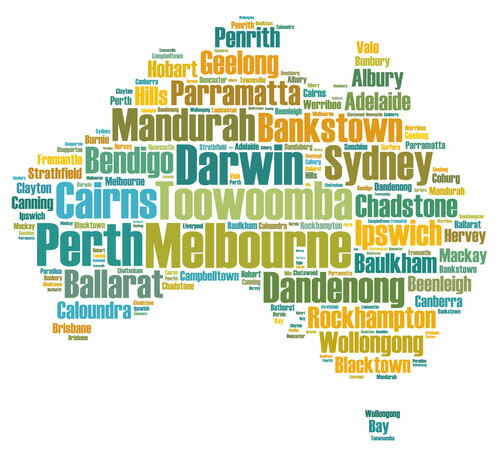 Despite the vast size of the continent, the majority of Australians live on the coast and in major cities. Around 75 per cent of Australia’s population lives in urban areas. Australia is the driest inhabited continent on earth. Its interior has one of the lowest rainfalls in the world and about three-quarters of the landmass is arid or semi-arid. These arid areas extend from the large central deserts to the western coast. Soils in these areas are characteristically very infertile compared to other deserts of comparable aridity. This has presented Australians with the challenge of how best to manage the variety of regions our continent possesses to meet the competing demands of agriculture, economy and conservation.